To understand the Ascendant, lets start with an example, of Sun. The Sun is at a point on the day of your birth, this is called your “sun sign”. Thinking of your birthday each year, you understand that the Sun returns back to your “birth sign” each year. This is what you are celebrating, the heightened “strength of the sun” within your body. The Sun takes 12 months to go around all the signs and return back to where it is “native” for you. The sun creates your Birth Sign, and also creates your Ascendant. The Sun creates your sign based on “day” of the year. The Sun creates your Ascendant based on “hour” of the day of your birth. Every 2.5 hours, the Sun’s “light” hits a different constellation. What this affect gives is that your “body” is shaped by the sign. Your “physical body” is born into that energy of the “sun’s light”. Like if you go to a party, you “dress as appropriate for the environment”. Ie, you could wear casual or fancy clothing depending on the party. Same with the Sun’s light. If the sun’s light is hitting a sign, your physical body “dresses as a sign”. Ascendant in Aries = Body dresses up as Aries, ie, is triangular in angles, looks aggressive, confident and skin tone is a more yellowed hue. Think of Moon, Cancer, and the 4th House traditionally. The “home”, comfort, motherhood, emotions, food, unconditional love, is the traditional sense of these positions. Individually, obviously it differs for each person ;), due to your 4th house lord itself and the moon’s position in sign and house. This is “the imum coeli”. It is the special name for “4th house lord”. The Imum Coeli/4th Lord, is the kind of home you want to live in, your relationship with your mother, it affects your thoughts, and is how you derive comfort. For example, if your 4th lord is Gemini, you will find comfort in communication. If the 4th lord is Capricorn, you will find comfort when doing hard work. Etc, etc. The reason for this is because the 4th House is traditionally ruled over by Moon, so it keeps these innate qualities even if it changes rulership. Ie, your friend still has the position of “your friend” even if they put on a different outfit that day. The 4th house is still your house of comfort, regardless how it is dressed up or what kind of a personality it has (sign and house). So in regards to the Ascendant, imagine that, directly opposite to “the most sun” is “the least sun” in the time of your birth. Think of the sunlight as “all about you”, like the sun traditionally is. Think of the darkness as “all about others”, this is your descendant. Your Ascendant being, “how you are seen to strangers, your body, external self.” Its “how you show yourself to the world”. Your form. The Descendant is “how you show yourself to those close, your inner associations, your internal self.” Its “the part of you that is only seen when a person delves into the dark side”. Your less known self. This self is only shown to people whom you no longer consider, “a stranger”. They still see your Ascendant, as your Ascendant is actually your physical body. But think of it like you are a planet, and a person can see the 3D of “all of your body” rather than just the 1D (one dimensional). Ascendant in Aries, Descendant in Libra. A person will act confident and cause arguments with strangers (Ascendant), though when comfortable with those people will be fair and mediate peoples disputes (Descendant). The Midheaven, is the special name for the position which gives you Status and Career. For example, if your Ascendant is Cancer, you count around 10 places, then your 10th lord is Aries < Aries’ ruling sign is Mars. So Mars is your 10th Lord, and it is that planet whom gives you status. In this example, the more aggressive people think you are, the more status you see yourself as having. If the 10th lord was virgo, the higher attention to detail people think you have, the more status you see yourself as having. Etc. Midheaven is your “status”, your “highest rising point”/ high to heaven. Ruled over traditionally by the red planet of fear, Saturn, it is meant to be a house of struggle of acquisition. You “take time to acquire your status and career”. The red vibration on the spectrum is the slowest moving vibrational colour. Depending on lordship sign, and location of the 10th lord himself, shows how much you can struggle for your success and how much status you will achieve. The 10th house and your Amatya Karaka are the indicators for your career. Ie, if your Midheaven sign [10th sign counting around] is Leo, than your status will be embroiled with drama. If your midheaven sign [10th lord] is Scorpio, your status will be infused with power. Etc. Status is defined as, “how you are viewed as by your surroundings.” Like your “public status”. How the public views you. Your rank in public hierarchy. You have a lord for all your houses, though there is special names for four of them. 1st Lord = Ascendant, 4th Lord = Imum Coeli, 7th Lord = Descendant, and 10th Lord = Midheaven. 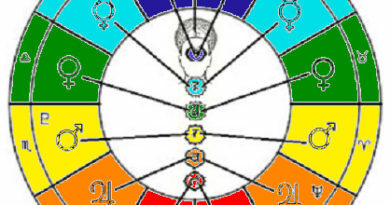 The four positions rule over your, Physical Body, Home, Inner Self and Status.